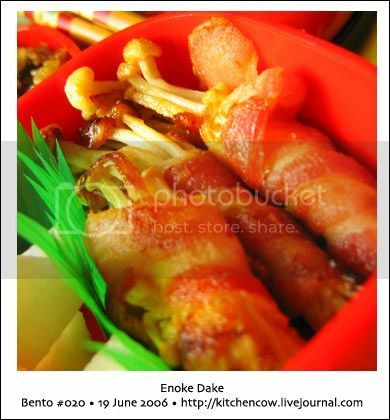 It was only after I had uploaded today’s bento pics when I realized that my bento’s theme was rolls! The lumpiang shanghai is a local version of spring rolls, and the enoke dake is golden mushrooms rolled in bacon. 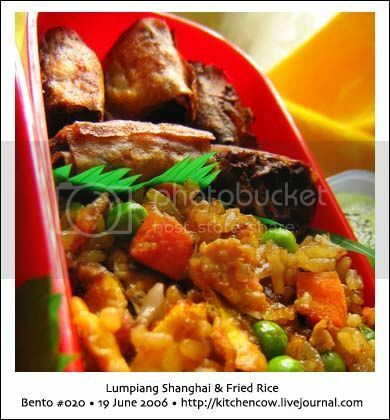 Lumpiang Shanghai Bites and Fried Rice. I like cutting the Lumpia into little bite-sized pieces before frying. Cutting not only makes them more fun and crispier, but also cuts the cooking time, specially since I usually fry them straight from the freezer. It’s easier for me to make large batches then just freeze them for future use. 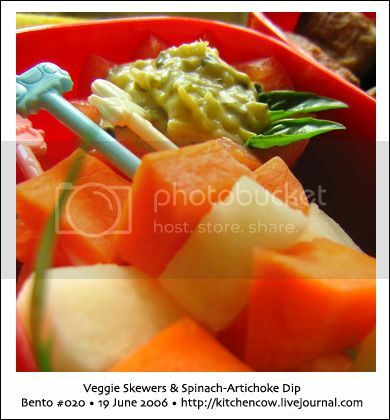 Veggie skewers! 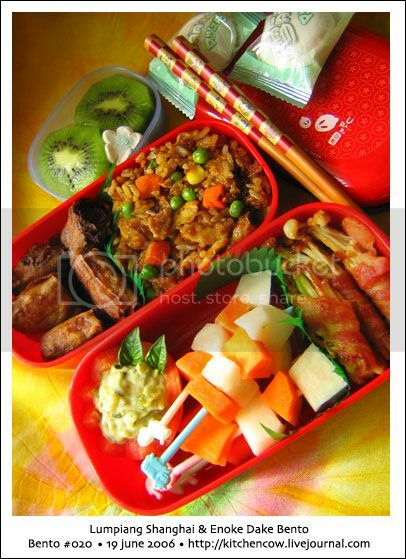 Crunchy cubes of fresh carrots and jicamas, strung alternately on cute animal tipped plastic skewers. My favorite is the cow tipped skewer, of course 😀 Served on the side is a dollop of Spinach-Artichoke dip (from Conti’s) on a carved tomato flower (or maybe crown?) with little basil leaves. To the right is a bunch of enoke dake, that’s enoke / golden mushroom wrapped in honeycured bacon. Kiwi slices with a little marshmallow flower. Looking at it now, it sort of reminds me of a face with big googly eyes and puckered up lips. A pair of green tea-filled marshmallows, for tucking under the bento top cover. Needless to say, with a spread this yummy, I definitely can’t wait to eat lunch.